Like all boats born from the innovative intuitions of Giuseppe Cimino and built with the professional accuracy and special construction technology of the Conam yard, the Synthesi 40 faithfully reflects the tradition of sporty motorboats. She features a special line, excellent performance, great seakeeping capabilities and comfortable, rational and ergonomic spaces on deck and belowdecks. 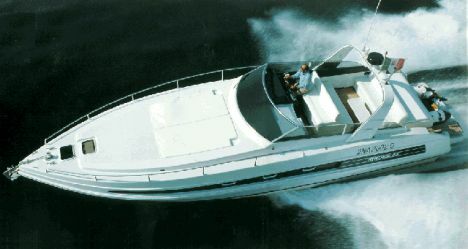 She was born in 1990 as a "synthesis" of her bigger sister Theorema, so that the Conam clientele could pass from the Lupo di Mare to a boat with more comfortable interiors and excellent performance. 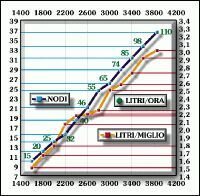 Nevertheless, the Synthesi had to adapt to the needs of the evolving market. In 1995, after thirty successfully built and actually sailing Sinthesi, the yard wanted to give a new thrust to this model. It renewed layout, fittings, waterlines, engine, transmission, etc. and it used new construction criteria. This is how the second version of the Synthesi 40 was born. We tested this new version: an extraordinary and fast boat that will certainly be commercially successful. Below a list of some of her distinguishing characteristics is reported. 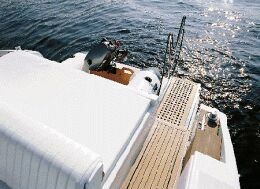 Aft the boat is totally renewed: the ample sunning area ends on a large swimming platform which includes the garage for the hydraulically lifted dinghy, a multi-function gangway, the covered swimming ladder and access to the engine room. Safety was a major concern: the self-inflating life raft was fitted on the side with a semi-automatic ejection system. 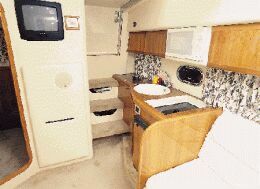 Interior comfort was improved: the new boat includes two private bathrooms - one per cabin, a guest cabin amidships with a double bed and a single bed, convertible dinette, etc. The boat is powered by 2x260hp Volvo Penta engines, with independent electronic controls, capable of propelling the Synthesi at a 30-knot cruising speed and at a 36- knot maximum speed. 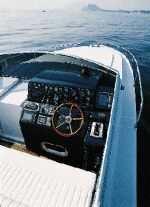 Overall, the boat is a synthesis of innovation and of rational safety, with excellent performance and construction characteristics that will astonish the Owner at all times. During the new millenium there will be much time to sail with Conam safety and sophisticated habitability. Draft from lower tip of propellers: 3'7"
Full boat displacement: 20,971 lbs. Total engine and reduction gears weight: 3,620 lbs. Price with standard equipment and test boat power: Lit. 410,000,000 ex VAT. Superstructures and windows materials: deck fittings are in stainless steel, windows are in tempered glass. 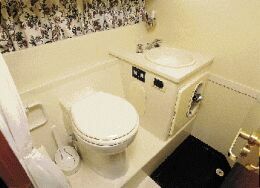 Galley: sink, refrigerator, two-burner range, cabinets and storeroom. Optional fittings: electronic instruments on request, air conditioning system, bow thruster, flaps, generating set. Electrical switchboard and plants: well positioned and fully fitted.